Career Services is devoted to assisting and supporting LGBTQ individuals throughout the career development process. Counselors in Career Services are trained to assist LGBTQ students with their career goals and to help them prepare an LGBTQ-friendly resumé. We partner with the Pride Center to present programs of interest to the LGBTQ community. 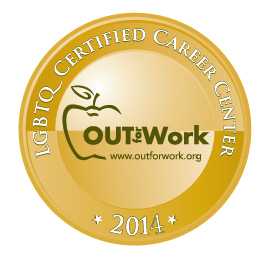 Career Services holds a Gold Certification from OUT for Work, a national organization that assesses the LGBTQ-friendliness of university career centers. Since the conception of OUT for Work, thousands of students have been educated, prepared, and empowered with a toolbox of knowledge to assist in a successful transition from academia into the workplace. It's an acronym for the Lesbian, Gay, Bisexual, Transgender, and Queer/Questioning communities. The plus (+) indicates the inclusion of all identities within the umbrella, including allies.